The population of Kazakhstan is 18 million people, while the penetration rate of cellular communication in the country reached 180%. With the correct choice of the tariff plan and good protection of SIM-cards from blocking, it is possible to run a profitable traffic termination business. 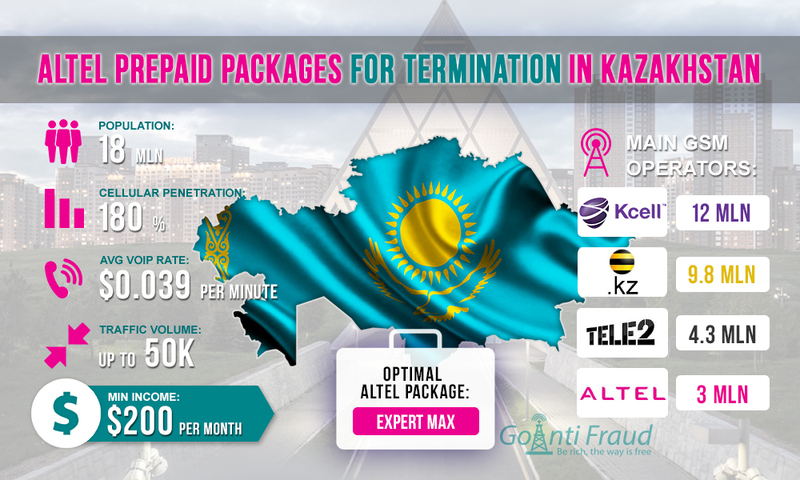 Altel is the fourth GSM operator in Kazakhstan in terms of subscriber base. Its services are used by about 3 million local residents. The company offers prepaid packages under fairly favorable terms. GoAntiFraud offers a comprehensive solution forbest GSM termination using GoIP equipment. We cooperate directly with Hybertone manufacturer, so you can buy GSM gateways and SIM GoIP banks at the lowest price. For those who begin doing VoIP termination, we offer NewBusiness solution that includes the required set of equipment, software for automation and tools to protect against the SIM-block. EXPERT. Subscription is $6.38 per month, unlimited call within the network + 200 minutes to make calls the numbers of other operators. EXPERT PLUS. Subscription is $8.31 per month, unlimited calls within the network + 250 minutes to make calls to the numbers of other operators. EXPERT MAX. $0.32 per day - unlimited calls within the network + 10 minutes to make calls the numbers of other operators. ON COMMUNICATION. Tariff plan has no monthly fee, provides 5 free minutes per day to make calls within the network, as well as calls for $0.035 per minute to the numbers of other operators. The most profitable tariff plan is EXPERT MAX. Firstly, due to the daily subscription fee, it is very unlikely that you will not be able to make calls before the SIM-card is locked. Secondly, the minute of the call within the network will cost $0.001. When the GSM gateway is running for 5 hours a day and with an average SIM activity period of 3 days, you can earn at least $200 via one channel, using EXPERT MAX. If you use multi-channel equipment, for example, addpac 32 port voip gateway, your monthly earnings will increase significantly.